A nostalgic outdoor engagement session is by far the best way to describe this amazing shoot. 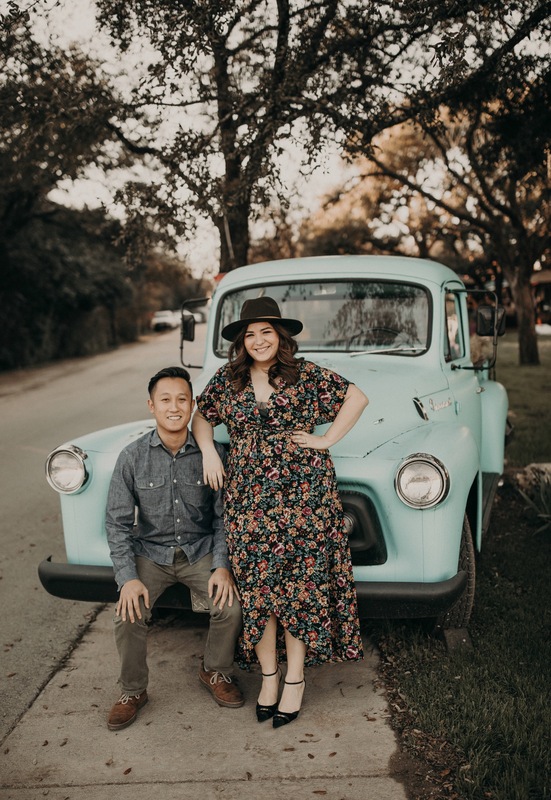 Marissa and Johnny decided to have their engagement session at Moontower Saloon, the place where these two love birds first met. But, not only was this the place where they first met, it was also where they had their first date AND their first kiss. If that’s not storybook worthy, I don’t know what is! I really had a great time photographing these two and even though the afternoon started out with a lot of rain and mud, by the time we were done it had turned into a beautiful evening. But I’m convinced that even if the weather didn’t clear up, it still would have been an unforgettable outdoor engagement shoot! We were able to capture a lot of epic and very authentic moments between Marissa and Johnny and as if that wasn’t enough, these two and the brilliant idea of having their friends hangout with them during their shoot. Needless to say, it was a lot of fun and did I mention that the friends hanging out with them were two of my favorite past engagement shoot clients, Heather and Alex? Heather and Alex are actually the ones who told Marissa and Johnny about me which was a huge compliment and I loved being able to get some shots of them all together at the end of the shoot!